It's time for the New Product Launch! All the Stamps, Die-namics, and Stencils can be found HERE. 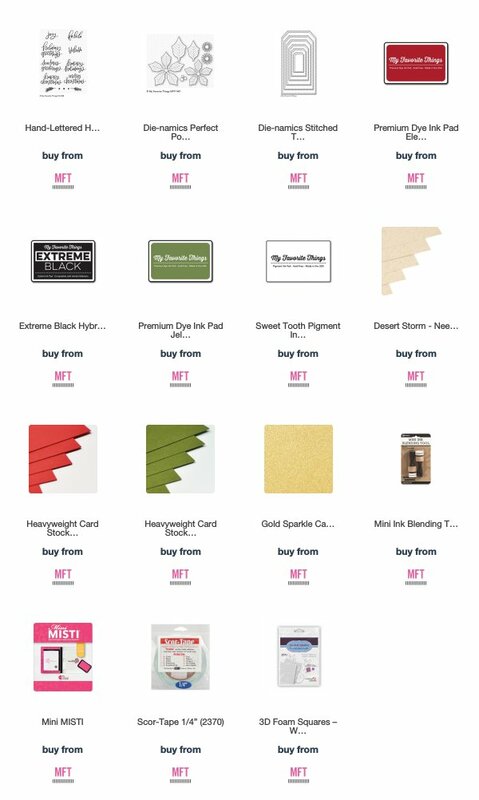 Please remember to visit each of the MFT Designers' July New Product Launch posts on the MFT Blog and leave a comment by the end of the day on Thursday, October 11 for your chance to WIN one of two, $100 Gift Vouchers. Ready? Set. Comment! I have a fun set of projects to share with you today. I made some simple Christmas treat bags for giving little gifts or holiday cookies. I've had the preprinted bags for years, I tend to haord things like this. I die-cut the Poinsettia in Electric Red and Jellybean Green card stock. I sponged the edges with the coordinating color of Premium Dye Ink. The tags were die-cut with the Stitched Traditional Tag Die-namics, I sponged Sweet Tooth Pigment Ink along the edges of the tags to give them that snowy feel. I used three of the sentiments from the Hand-Lettered Holiday Greetings stamp set on the tags. I finished off the tags with some sparkling gold twine. Beautiful flowers ! Nice job I’m excited to go shopping , I need to win ! These would make perfect teacher gift bags! Love these - and Terra is right, perfect for teacher gifts this holiday season! Thanks for sharing it! So beautiful! Love the pop of colour against the kraft, and the delicate white "snow" adds to the background for sure! I love this, such a perfect holiday treat bag! Julie, your poinsettia, tag and kraft cards are positively swoon-inducing! The gently falling snow adds such a lovely touch! These, combined with the dazzling delights you shared throughout the release countdown, have certainly ignited my festive spirit! Merry, bright and gorgeous, all! Lovely way to embellish gifts, this is my favorite product from this release! Thanks for the inspiration Julie! Oooo . . . these are gorgeous!!! And such a great way to package up some Christmas treats! Ok Julie, you have reminded me that I should go through my stash and dig out those cute little bags and twine that I already have...and stamp them....and decorate some tags....great idea for a dinner plate gift at the holiday table. Such a great idea....thank you so much for sharing every day!!! Lovely work. Very pretty! And an awesome way to present a gift. Your tags are beautiful! I'm loving those hand-lettered sentiments. Just gorgeous! Very pretty. Love the poinsettia. Absolutely beautiful. I love this die! Just beautiful - almost to pretty to open! How perfect! I would not want to open these... I would just stare at their beauty! Such beautiful treat bags. The poinsettia is awesome on the brown bag. Those bold poinsettias look so pretty against the kraft background. Very festive! So cute! love the flower and the polka dots. What a gorgeous way of packaging gifts! Just beautiful! Love the holiday gift bags you made! The beautiful red of the Poinsettias looks beautiful on the kraft bags. Decorating the bags makes the polka dots look like snow. The lovely gift tags and bows really finish off your project perfectly! Gorgeous gift bags! Perfectly executed and wonderfully festive. What a beautiful card! 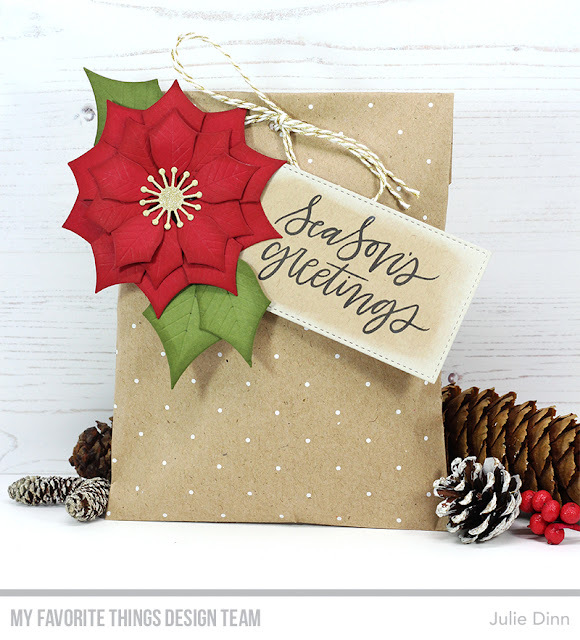 I love the poinsettia and the font style on the sentiment! Love the kraft, red and white color combo for Christmas. Who wouldn't want to receive one of these gift bags? Wow these treat bags are just so pretty! Easy to mass produce too. Tja ks for the inspiration. Love your packaging. I think I need to make some bags. Julie, those are simply beautiful cards! I love poinsettias, but when paired with the kraft colored cardstock, they look amazing! wow love these treat bags - what a great way of using these products!! Such cute gift pouches and tags! I had not even seen the poinsettia dies until your project. Love it! Love your treat bags! And those tags are a lovely touch. Beautiful color pop against that kraft paper! Pretty treat bags! I love those gorgeous poinsettias! I have a pack of hoarded mini pizza boxes that would look lovely with the poinsettia. And isn't the Hand-Lettered Holiday Greetings font stunning? Gorgeous Xmas projects!!! Love them!!! Way to dress up brown bags! So pretty! What great treat bags! The poinsettia is lovely! Love the treat bags. I tend to hord too and then I can't find it when I need it or remember if I bought it already. Oh well, it's the life of a crafter. Fabulous tags! Love the poinsettia and them! Fabulous tags! 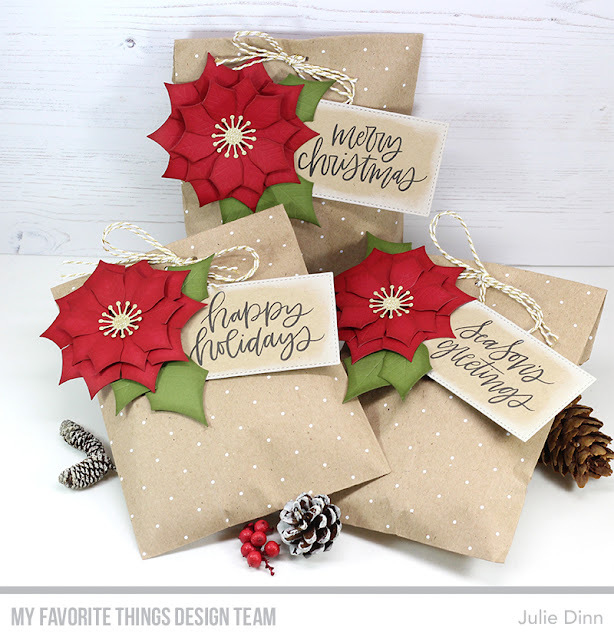 Love the poinsettia die set!